There’s nothing like a good cup of tea to jump start your day, pick you up on a sleepy afternoon or even help you wind down in the evening. This age old drink is one that many enjoy not just for its taste, but for health benefits as well. As many people know, drinking herbal teas is an excellent way to keep the body in tip top shape. Unlike your normal tea, these are made from infusions of seeds, roots, leaves or bark of herbal plants, as the name implies. These caffeine free drinks not only satisfy the pallet, but do wonders for the body as well. If you haven’t included tea in your daily diet, there are plenty of good reasons that you should. 1. Boost the Immune System- Green tea is known to keep the system away from illness, but many different herbs can do the same. Rosehip, ginseng and dandelion are just some teas which can work to keep the body’s immunity up. 2. Detoxify- Have you been feeling sluggish and tired? Flushing out the toxins from your system can help. Herbal teas such as rooibos can promote liver and gall bladder functions to facilitate waste removal from the body. 3. Calm and Relax- If you need to unwind after a long day, or you just feel the need to slow down grab a cup of tea with chamomile. This has been proven to relax blood vessels and muscle fibers. 4. Improve Concentration- Having trouble focusing on your tasks at hand? A dose of peppermint will help increase dopamine levels in the system, improving alertness and concentration. Citrus can also help perk you up and clear the mind. 5. Relieve Anxiety- Stress is a part of daily life, but when it builds up it can cause anxiety. Calm your nerves with some lavender which has been proven to work against General Anxiety Disorder. Lemon balm has also been proven to lower stress levels. 6. Reduce Inflammation- Swelling of tissues in the body can happen anytime due to various reasons. Regardless of where your inflammation occurs, regular intake of tart cherries can help keep it at bay according to Health Impact News. The best part is that these taste delicious as tea. 7. Aromatherapy- No need to buy essential oils or incense sticks. Each time you steep some herbal tea you also get the benefit of smelling it. A whiff of these herbal ingredients can help improve brain and body functions. 8. Ease Nausea- Whether you’re queasy from motion sickness, morning sickness or an upset stomach, ginger tea will work for you. It helps with secretion of digestive juice to soothe stomach acids and relax digestive muscles. 9. Anti-aging Properties- Contrary to popular belief, green tea isn’t the only drink that contains large amounts of anti-oxidants. Herbal brews made with blueberries and pomegranate can do the same for you being packed with polyphenols and flavonoids. 10. Skin Care- Skin care can go beyond what’s on the outside. Regular intake of herbal teas can help care for the skin from within by stopping oxidative stress in the cells and promoting regeneration. Aside from the usual antioxidant blends, try something with apples. 11. Better Sleep- Whether you suffer from insomnia or just want a more restful sleep, reach for some lavender, chamomile or lemon balm based tea. These calm and relax the body which can help you sleep better. 12. Fight Obesity- Aside from exercising and eating right, drinking raspberry tea can help keep weight under control. According to studies, these berries contain phytonutrients which increase metabolism in fat cells. It also helps with preventing fatty liver. Tea Forte offers a delicious raspberry and hibiscus blend that can be enjoyed hot or cold. 13. Lower Blood Pressure- Increased blood pressure has been linked to a number of health risks including stroke, cardio vascular disease and even death. Hibiscus based teas can help reduce the risk for these by naturally lowering blood pressure. 14. Fight Colds- Feeling a little bit under the weather? There are various herbal teas that can help cure the sniffles. Lemon, fennel and cinnamon are some good choices when it comes to dealing with colds. 15. Alleviate Indigestion- If you’ve had a bit too much to eat, or your last meal isn’t sitting well in your stomach, a herbal brew can help you feel better. Teas are generally known to help with digestion. Lemon grass in particular is good for dealing with gas and bloating. 16. Uplift Spirits- As mentioned earlier, lots of different herbs can calm the mind and body. People suffering from the blues or mild depression can take advantage of this. Blends containing vervain have long been used by herbalists to help improve moods. 17. Get Rid of Phlegm- Cough and other respiratory illnesses that stem from the buildup of phlegm can be eased with herbs as well. Licorice in particular works as an expectorant and is good for easing cough as mentioned on Live Strong. 18. Cleanse- Teas are natural diuretics that can help the body with cleansing. Those made from cranberry, peppermint and ginger are particularly good for fighting urinary tract infections. 19. Increase Milk Supply- Breastfeeding mamas will certainly enjoy the benefits of a fennel based tea. Studies show that this can be used to increase milk supply and aid in lactation. 20. Ease Headaches- Health conditions, stress and the daily grind can all cause headaches every now and then. The next time that you feel one coming on, reach for a cup of herbal tea. Good choices for alleviating headaches include peppermint, basil and lavender. 21. Control Anemia- Lack of sleep and low iron levels are common culprits for anemia. Certain herbal teas contain high levels of iron that can help combat this illness. Apricot and red raspberry leaf teas, as well as those with nettle are excellent choices. 22. Keep Eyes Healthy- As people age it is normal for eyesight to weaken as well. Drinking herbal tea made with apricots can help prevent this thanks to high beta carotene content. Another option is plum tea which is known to slow down macular degeneration. 23. Provide Nutritional Supplements- Aside from the many benefits of herbal teas, these are also a good source of essential nutrients. Vitamin C, calcium, iron, magnesium, zinc, potassium and sodium are just some examples of vitamins and minerals found in herbal teas. 24. Increase Energy Levels- Coffee isn’t the only way to get an energy boost during the day. Peppermint tea can help pick you up without the use of caffeine. 25. Strengthen Teeth and Bones- Milk isn’t the only way to provide your body with more calcium. Many different herbal teas contain high amounts of calcium including peach, cinnamon, peppermint and rooibos. 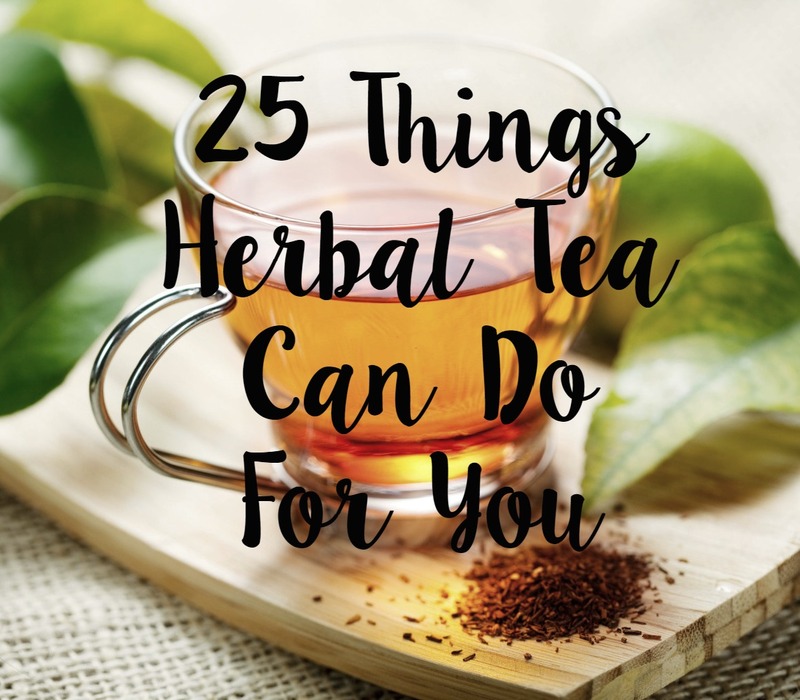 Aside from these 25 benefits, there are many other advantages that come with drinking herbal tea regularly. To better enjoy these healthy brews, look for something that comes with a unique blend. Author Bio: Health buff and tea expert, Regina enjoys sharing her knowledge on the subject to others during her free time. Find more information about the various tea blends she mentioned at Tea Forte.